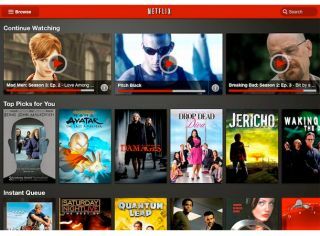 Netflix has unleashed its newly-designed app for iPad, a week after the Android tablet iteration was given the same lick of paint. The new offering brings a brand new interface which is a marked improvement on the initial version. It aims to give greater visibility to Netflix's vast array of streaming content. "The new design is much more immersive and provides greater focus on the growing number of titles in the Netflix catalog," said the company. "In fact, the new interface displays twice as many movies and TV shows as before, enabling you to discover even more titles you'll love. "Also, we've taken greater advantage of the tablet's unique features, inviting you to swipe through rows of titles featuring larger artwork." Netflix 2.0, which is a free download, still lacks Apple's AirPlay technology that allows users to stream content to the Apple TV set-top box. Apple TV has its own Netflix app, but the advantage of AirPlay integration would be the ability to send content from the app to the TV set.